Fall in Southern California is the season for the infamous Santa Ana devil winds, where the temperatures rise to more than 100 degrees, the humidity can drop to as low as 2-3% and the hot, dry winds from the desert can exceed 70 miles an hour. These conditions follow our dry summers where it is common to have no rain since May or June, so all vegetation is usually very dry and any spark can start a fire. These were the conditions we had starting around October 20, 2007. Three fires started around 40-50 miles east of us on the 21st, and we had two days directly downwind of the 300,000 acre conflagration. We were on an evacuation alert, but the winds died down with the fire front about 7 miles to the east of us about noon on October 23 and the fire crews were able to contain it at that point. During those two days, the smoke was so thick at times the street lights came on during the day and the visibility was less than a quarter mile. The temperature was in the 90s with about 5% humidity and winds up to 50 miles an hour here at the coast. We couldn't go outside with out a respirator for most of that time, and still coughed a lot more than usual for a month afterwards. The amount of pulverized ash that collected on the ground in protected areas was as much as an inch, although the wind kept most areas to a quarter of an inch or so. All the plants had a good amount of ash on the leaves and the nursery was grey when the wind died down. We weren't able to sprinkle the nursery down during that time, which in retrospect was a good thing. If I had watered, the ash would have stuck to the leaves and made a muddy caustic mess, and we would have probably had a lot more damage than we did. The ash is quite caustic, so we watered with a highly acid wash after the danger had passed to help neutralize the ash on the plants as it washed as much off as possible. For the most part, this seemed to help, but we still saw quite a bit of damage to some plants. 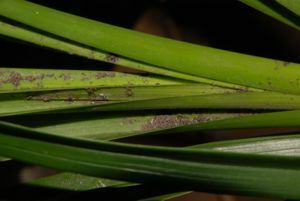 The worst problem was the ash that collected in the young new growths on Zygopetalums, Many of the growths lost the inner leaves to a muddy ash residue and those that didn't had quite a few black spots where the ash had burned the leaves. We lost buds and spikes on a number of cymbidiums due to the high temperatures, but the mature leaves and growths seemed to be relatively unaffected. Many of the exposed buds that didn't drop from the heat were scarred on the outside from the ash, and many had a muddy residue on the bottom that was difficult to clean off with water. Some plants had significant burning of the leaves that were emerging from the new growths, but fortunately, most growths were small enough so they didn't collect much ash. Most of the older leaves had no damage at all, but a significant amount of ash collected at the base of the leaves. With the acid wash, most were unaffected even at the base. We found a lot of other residue from the fires as well that had worked through the gaps in the shade cloth. 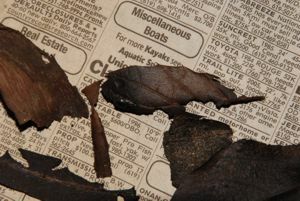 We found intact carbonized tree leaves up to three inches long laying in the plants, and pieces of carbonized stems a half inch in diameter. There were many smaller pieces that had been pulverized by the wind as well. The size of the pieces indicates the strength of the winds, since the fires were about seven miles away at the closest point. We have included a few photos of some of the damage around the nursery and some of the wind borne debris as well. Click on the smaller images to bring up a larger image. 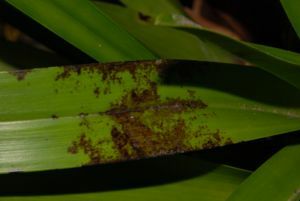 This is typical damage to a young cymbidium leaf where ash collected in the new growth, and burned the leaf surface. This photo was taken several months after the fires. 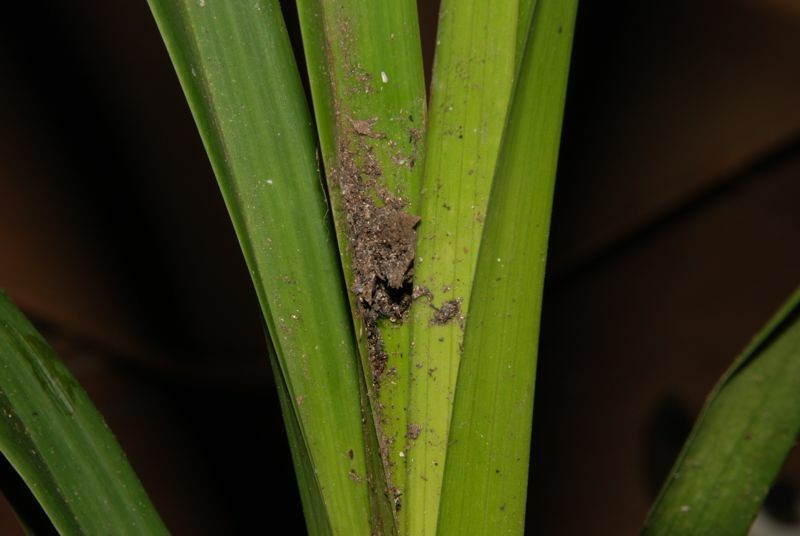 This is another young cymbidium leaf damaged by the ash. Much of the damage probably occurred when the ash got wet. This photo was taken several months after the fires. This young cymbidium leaf was burned nearly through by the ash collecting in the new growth. This photo was taken several months after the fires. 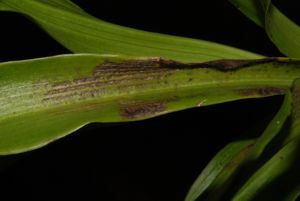 This is typical damage to the leaf on a zygopetalum. Many were damaged more severely than this, and many young leaves died completely This photo was taken several months after the fires. Virtually all our cymbidiums had large amounts of the ash debris collected at the base of the leaves. Many had more ash at the base than shown in this photo. 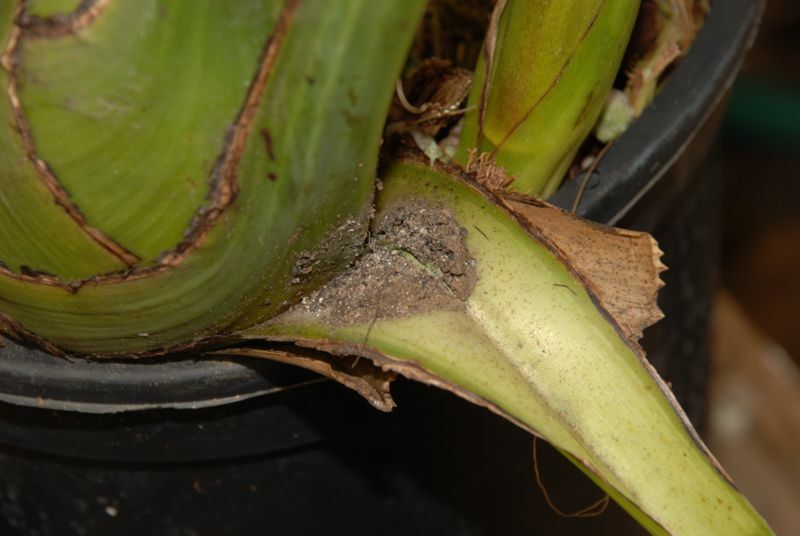 Many of the new growths on our cymbidium had large masses of ash and other wind blown debris collected in them. As the leaves grew, it exposed the amount of ash. 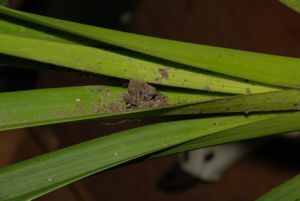 This is another photo of the ash residue collected in the new growth of a cymbidium. 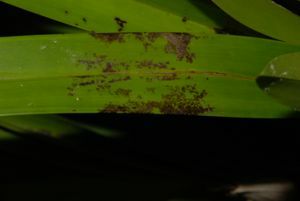 Some minor surface scarring was seen on the leaves on many plants, and some were severely burned. 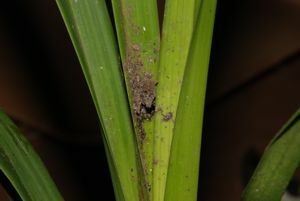 This photo gives an indication of the amount of ash and debris that collected in some cymbidium new growths. The debris took several months of watering to clean off, and usually just washed down further into the growths as they matured. Most of the damage seemed to occur just after the ash collected on the plant, not later, so the ash that washed on down into the growths seemed to have little effect. This is one of the largest carbonized leaves we found in the nursery after the fire. It is about 3 inches long, and had blown at least 7 miles and then blown through a gap in the shade cloth. 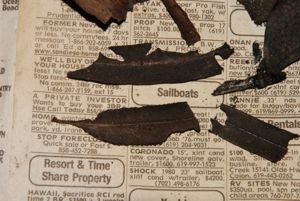 These leaf fragments were typical of the large numbers we saw after the fires. Most were less than an inch long, but these were closer to 2 inches. 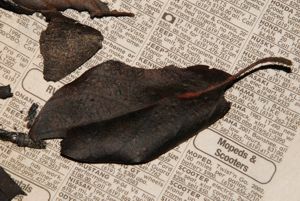 Some more of the leaves that had blown in during the fire. Some were more carbonized than others, and some were only lightly browned. 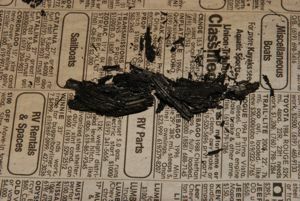 This is a large chunk of some plant stem that we found in a plant after the fire. It is about 3 inches long and up to a half inch in diameter. This was all carbon, and quite fragile. I'm not sure how it managed to survive the wind intact.